Jewellery making can be hard work! So if you find yourself rushed off your feet in the workshop, this post should give your some inspiration and maybe introduce you to some new products that will help you slow down. We've selected 10 jewellery making supplies which will not only help you save time but also make the process more efficient! Ever have those moments at the workbench when you need to quickly adapt, change or add something to your design but will have to completely stop what you are doing to source the materials? We do... a lot! Which is why we created a handy collection of different assorted packs. Each assorted pack has a variety of options to choose from for different aspects and areas of jewellery making. There are 5 in total - findings for earrings, findings for bracelets and necklets, jump rings, head pins & eye pins and silver sheet. It is so handy to have these options ready and waiting when your are making. Becasue there is no time for sore fingers to get in the way of jewellery making! 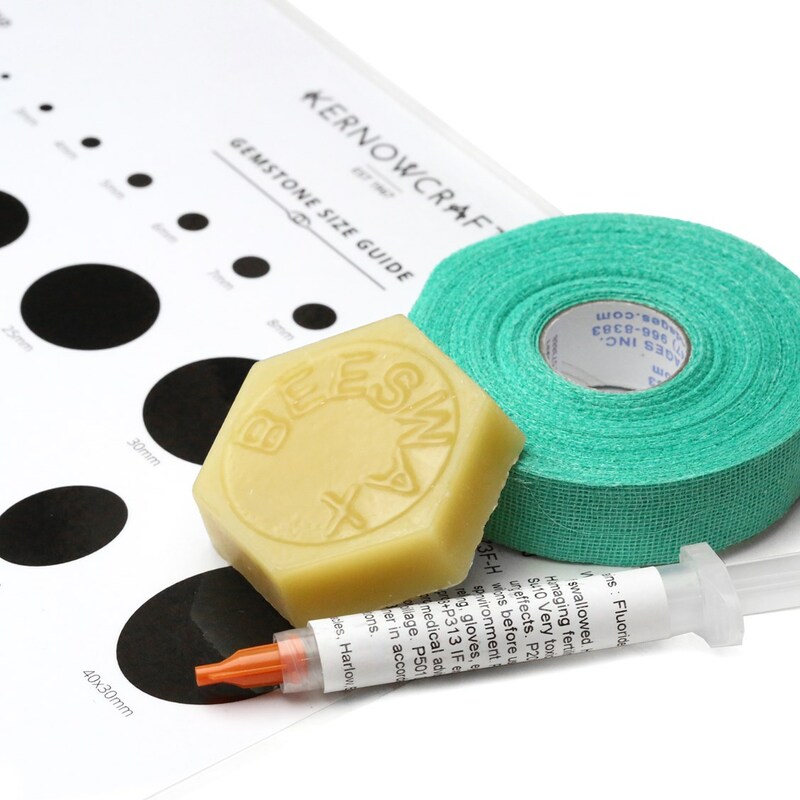 Alligator skin finger protection tape will protect your fingers from minor cuts, abrasions and burns. It provides great grip and more flexibility than protective gloves when filing, sanding, polishing, buffing, grinding, assembling and stone setting. It is thin and flexible and the clever part is that it only sticks to itself, so it leaves no sticky residue, it won't stick to clothing or hair and it is easily removed. There is nothing more frustrating than when sawing metal and your blade keeps sticking. Well actually there is... when the blade snaps! Beeswax helps the blade of your saw glide gently through the metal and assists in the prevention of 'sticking'. Swipe the back of the blade as it is the back of the blade that gets stuck and can cause binding up. Binding up is when the saw is being pushed through the metal sheet quickly or forcefully which can cause the blade to bend and break. Ordering gemstones over the internet is a tricky business - the exact size is not always obvious and having to return stones because they aren't the right size is a real time waster. Our gemstone size guide was designed to help avoid this issue. It has accurate sizes of the popular stone sizes for cabochons and faceted stones and is immensely useful to help you visualise stone sizes when designing jewellery. We can't really think of a better time saver when it comes to soldering than our sterling silver solder paste. Not only does it stay where you want it to, making it very simple to use as well as much quicker and easier than traditional solder, but there is also no need for extra flux when creating as it is already mixed in with the paste. Save crucial time in the polishing process by avoiding fire scale after soldering with safety pickle - one of the top jewellery workshop essentials! Our safety pickle works quickest when it is warm so simply mix 1 teaspoonful with warm water in a covered glass or plastic container, immerse your pieces in the solution after soldering until the soldering residue has been re-moved. If you have a lot of metal jewellery to polish, the barrelling machine could quite possibly be the ultimate time saver. You can polish multiple pieces at a time and get on with something else whilst the machine works it's magic. We have found that 45 minutes to an hour is all it takes for a beautiful high shine, however it does depend on the designs you are polishing. These emery sanding and polishing sticks make things more efficient when finishing and polishing your metal designs by hand. The wooden base provides a good hard surface for sanding against which gives much quicker and more consistent results than loose papers. They have sanding or polishing paper on all four sides for ease of sanding, even in those hard to reach places. The paper will also last longer than when using loose emery papers as the solid backing makes them less liable to tear or wear unevenly. We know we go on about the diamond coated bead reamer, but it really is one of the most handy-to-have tools we provide! It can be so frustrating when just a few of your gemstone beads don’t quite fit onto the thread or wire you have chosen. Having to re-consider your design or place an order for more is a real time waster. The bead reamer enables you to gently enlarge the holes in stone, glass, ceramic beads as well as pearls. Used with water to lubricate and some gentle 'twists' is usually all it takes. If there is one tool that will make the whole jewellery making process more efficient, fast, professional and high quality It is the Dremel 4000 multi tool! The Dremel is one of the most universal tools on the market and despite its small size it is surprisingly powerful. It offers numerous possibilities due to the multitude of accessories including detailed sanding, carving, engraving, cutting, grinding, cleaning and polishing. The Multi Sizer Ring Sizing Gauge - An easy to use and extremely affordable ring size gauge. This reuseable, multisizer is a great little product to have on you at all times, after all, you never know when a ring commission may come about! Sterling Silver Plain Edge Bezel Cups - Perfect for quick and easy calibrated stone setting. Devcon Epoxy Glue - Our most recommended and reliable glue - use for quickly setting gemstones on flat plates or other similar settings or whenever you need that extra bit of security.